Tis the season and that means that some of your favorite artist's and illustrators will be posting work and products they created for the holidays. If you are anything like me, you don't buy a lot of gifts. Maybe you make your own gifts or just don't celebrate in a huge way but you still want to support the independent sellers and artists. Here's how to do just that and it won't cost a penny! All you have to do is SHARE! Here are a few simple ways to do just that. 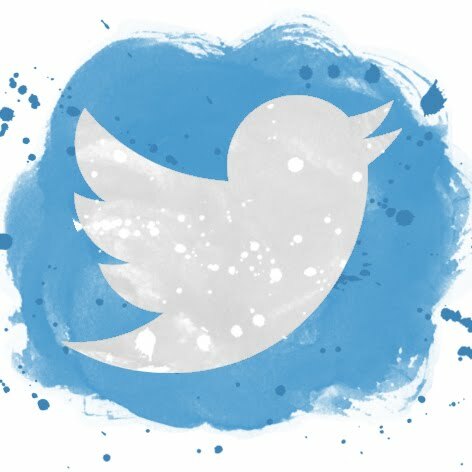 Share an artist's shop updates. When an artist posts new work, hit the "share" button and say something like " Check out so in so's page, I love her/his work!" or "Isn't this cute?" Also, giving the image a "Like" doesn't hurt either. 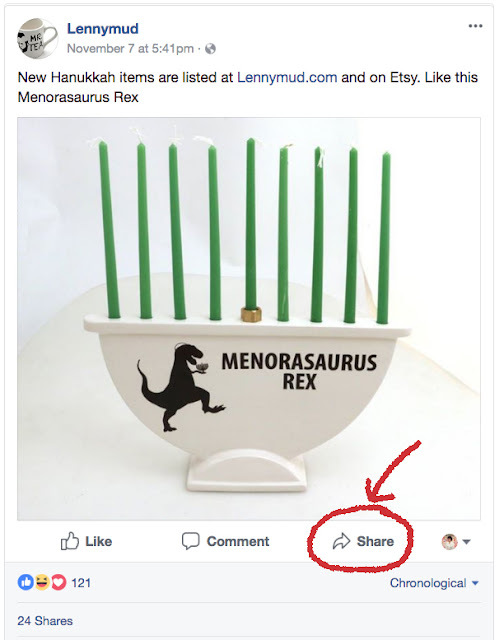 I love this Menorasaurus Rex menorah from Lennymud, so I shared it on my Facebook page for all of my friends to see. "Like", comment and re-gram the images. If you think a friend or colleague would be interested in the artists feed, tag them in the comments. See what I did there? In the comment section I tagged someone. 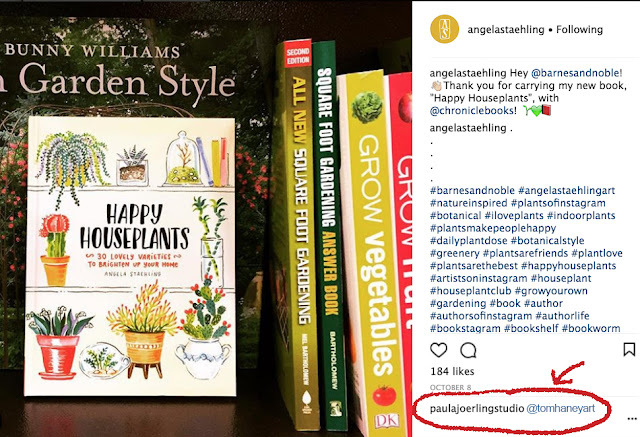 I want this "Happy Houseplants" book by my friend Angela Staehling for Christmas. That guy I tagged happens to be my husband. Hopefully he will get the hint! Like shops and items by clicking the heart. 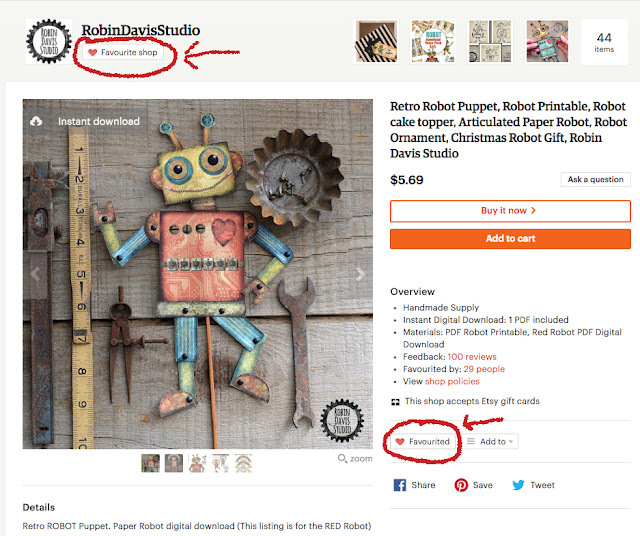 If you are already on etsy and are looking at an artist's shop, click the heart. It helps that artist get found more easily in the search and this means everything to an etsy seller! You can favorite the whole shop or individual items. Also, you can help spread the word more by clicking the "Share" "Save" or "Tweet" buttons. 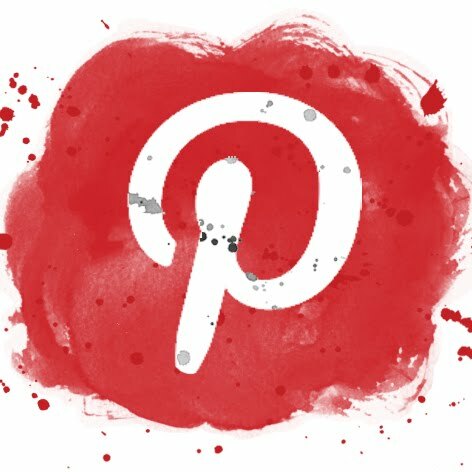 Pin an artist's images and shops to your boards. Start a board called "Shops I Like" or "Art I Like" and pin images from an artist's etsy page or blog? Naturally you can also re-pin it to board that you already have. 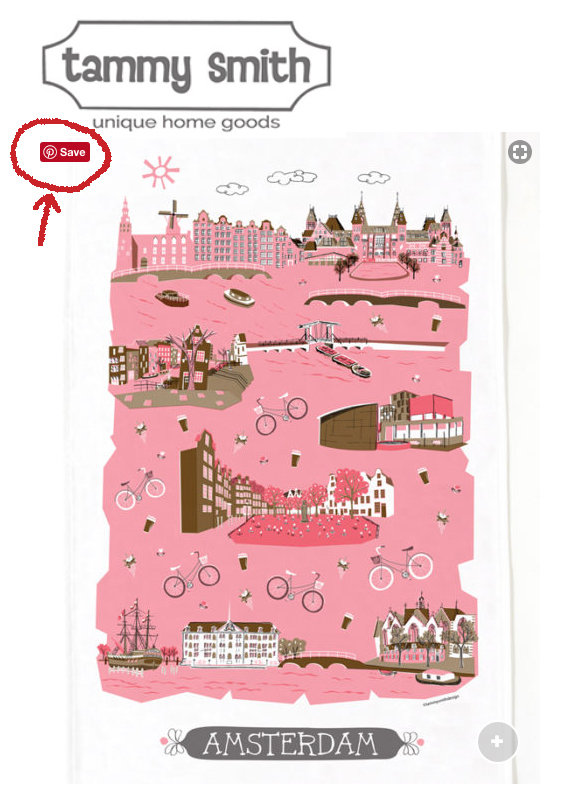 I pinned this tea towel by Tammy Smith Designs to my Pinterest board titled "Tea Towels". I pinned it directly from her website so that if someone clicks on the pin, it will go directly back to her shop. Easy right? and you are helping spread the word which is so important to an artist and independent sellers. I know I greatly appreciate all of the shares. comments and hearts that I get on various forms of social media. So what are you waiting for? Get out there and start clicking! Hello and welcome to my first ever calendar giveaway! 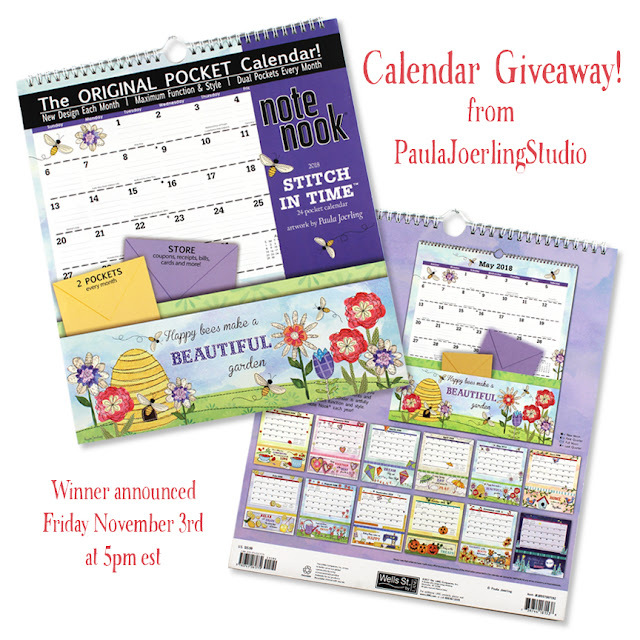 The winner will receive my 2018 Note Nook "A Stitch in Time" calendar from Lang/Wells Street. There are two super easy ways to enter and win. 2. In the comments section, tag 2 friends who you think would like to win a calendar. That's it, you have been entered! 2. Share my post about the giveaway on your page. If you do both of the above, you are entered twice! Don't like to enter contests but you want the calendar for you or as a gift? Follow the link to purchase from the Lang Website. Good Luck! and thanks for stopping by.